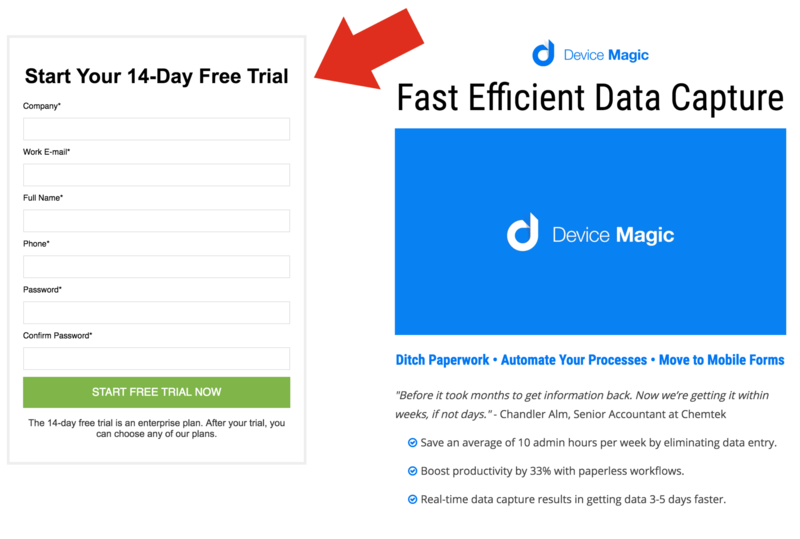 To create a new Mobile Forms account, click the "Try it Free" button on the Device Magic home page and enter your details in the form that follows. A valid email address is required to activate the account, so make sure you enter this correctly. All users are automatically issued with a 14-day trial account with full Enterprise functionality. After 14 days you will be contacted by email to allow you to sign up for a paid account or migrate to a free account. Free accounts only support a single device, and have limited functionality. Once an account has been created you need to activate it before it can be used. An activation email will be sent to the email address you entered at sign up. Click the link in this email to activate your account. Note: If your email client does not let you click on links within emails, copy and paste the link into your browser address bar and press enter. Following the activation link will automatically log you into your account and take you to your organization's home page. However, you can always log in by entering your credentials on the page that follows after you click "Log In" at the top right hand corner of DeviceMagic.com. That's it, browse the rest of our Help Center to learn more about how to use your new Device Magic account.